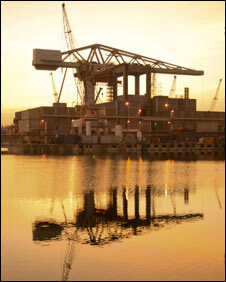 One of the largest cranes in Europe has been removed from a naval dockyard in a major engineering project. The 1,450 tonne structure, with a lifting capacity of 80 tonnes, was located in the Submarine Refit Complex at Devonport Dockyard. The work to remove the crane, a major Plymouth landmark, was carried out jointly by the Ministry of Defence (MoD) and Babcock Marine. The crane was used to help refit Swiftsure and Trafalgar submarines. Commodore Ian Jess, the naval base commander, said the "ambitious and complex" engineering project had been completed successfully and safely. "A major part of the area's skyline has now been removed which is of great interest to many residents and thousands of people who work in Devonport and beyond," Cmdr Jess added. Roger Hardy from Babcock Marine said the removal of the crane was a major milestone in the upgrade of the nuclear submarine facilities at Devonport. Constructed by Stothert and Pitt in the 1970s, the colossal hammerhead cantilever crane is 120m (394ft) long, 22m (72ft) high by 8.5m (28ft)wide. Mammoet, a Dutch heavy lifting specialist involved in raising the Russian nuclear submarine K-141 Kursk from the Barents Sea in 2001, helped move the crane onto a floating barge. No nuclear submarines were in the vicinity during the lowering of the crane and about 600 staff were moved from the refit complex during the work. 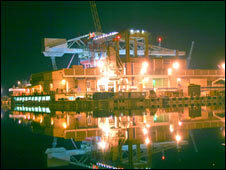 The dismantling of the crane at the dockyard is expected to continue until January 2009.